Home > Ear Treatments > What is an Ototoxic Drug? An ototoxic drug is one that can damage the structures inside the ear. This is a side effect of the drug and the hearing loss that results is often temporary – but it can be permanent. If you have an underlying problem with your hearing, such as sensorineural hearing loss, taking a drug that is ototoxic can make the problem worse. Which Common Drugs are Ototoxic? You might think that ototoxic drugs would be very unusual medications taken for rare conditions but several classes of common drug cause ototoxicity. People who take aspirin and tablets that contain aspirin in combination with other drugs often start to experience hearing loss if they take more than 6 to 8 tablets each day. Many people with painful arthritis take aspirin in this sort of quantity. Fortunately the impact of the toxic effect of aspirin on hearing is temporary. As soon as the aspirin is stopped, the hearing starts to recover immediately. Several no steroidal anti-inflammatory drugs used commonly for pain relief also cause reversible ototoxicity when taken regularly, once a threshold dose of around 8 tablets a day is reached. In the UK the NSAID that is used very frequently is ibuprofen but other forms such as naproxen and etocolac can also cause hearing problems. As with aspirin, the ototoxic effects of NSAIDs are reversible and wear off when the drug dose is reduced or stopped. Antibiotics such as erythromycin and vancomycin and some of the aminoglycosides such as streptomycin and gentamycin also caused hearing loss when they are used in high concentration for life threatening infections. Hearing loss only occurs when the antibiotics are given intravenously in an emergency situation when the blood levels go higher than anticipated – as would happen if someone was rushed into hospital with bacterial meningitis and the antibiotic treatment was needed to save their life. If you have a heart condition or problems with kidney function you will be given a variety of drugs to relieve symptoms, including diuretics. Many of these, including furosemide, are ototoxic, as are common cardiac drugs such as metoprolol and lidocaine. For people with several health problems, it is important to report any change in your hearing as soon as possible – if you are taking a diuretic, an antibiotic and a pain killer, all may be ototoxic and will have a much more severe effect on the delicate inner ear. Many drugs used in chemotherapy regimens for the treatment of cancer are known to be ototoxic. Chemotherapy agents such as cisplatin, vincristine and some of the older, mustard based chemotherapy drugs can damage the hearing. As this side effect has been noted, treatment dosages have been modified so that the blood levels of the drug don’t reach the highest levels that cause damage to the inner ear. Another class of drugs that is known to have ototoxic effects are some forms of quinine that can be used to treat malaria. Related drugs used to relieve night cramps can have the same effect. Alternative drugs for both malaria and night cramps are now available and these are used preferentially to avoid damage to the hearing. What Happens When and Ototoxic Drug Affects the Hearing? One of the first signs that a drug is beginning to damage structures in the inner ear is the development of tinnitus. This can occur in one ear only, or in both ears. 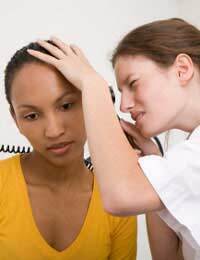 If you are taking a new drug for the first time and you start to experience tinnitus, when you have never had it before, you need to tell your doctor straight away. If the drug is continued, the tinnitus gets worse and many people experience a feeling of pressure inside their ears. The quality of hearing then starts to come and go and periods of deafness follow. In some people, ototoxic drugs affect the hairs in the inner ear that are involved in balance and this causes vertigo, dizziness and the sensation that you are spinning around. When this happens, you often feel very sick too, and these unpleasant symptoms can only be relieved by stopping the drug treatment immediately. Some people are more sensitive to the ototoxic effects of drugs than others. Always report any change in your hearing to your doctor if you are undergoing active treatment with a new drug. It’s also important to be aware of the symptoms of ototoxicity if you are taking a lot of painkillers – you doctor will be able to help prescribe alternatives to aspirin and NSAIDS if you start having hearing problems.